The Jordan Valley, which makes up two thirds of the occupied West Bank, is the forgotten land in the Israel-Palestine conflict. The struggles of the Palestinians who live here receive little attention, and it often escapes the notice of international solidarity groups and NGOs. There is total Israeli control over 95 per cent of the valley, designated ‘Area C’ under the Oslo Accords. Many of the 56,000 inhabitants now live in the other 5 per cent – just five small villages and Jericho. The area had a population of 360,000 before 1967, but with the war came the mass expulsion of people from the land they had farmed for generations. This was then turned over to ‘natural reserves’ (often used as a convenient label for areas Israel seeks to control), military bases and settlements. The expansion of the settlements continues at a rapid pace – they now cover half of the valley. The contrast of the settlements’ lush greenery with the more barren, desert-like landscape of the Palestinian land shows the occupation at its starkest. Israel’s determination to capture the valley rests on its huge strategic importance. The area also has vast arable lands and important water reserves (estimated at almost half of total water resources in the West Bank). It would be the only place a Palestinian capital in Jerusalem could expand. The population remaining in Area C now mainly comprises farmers and Bedouin communities. 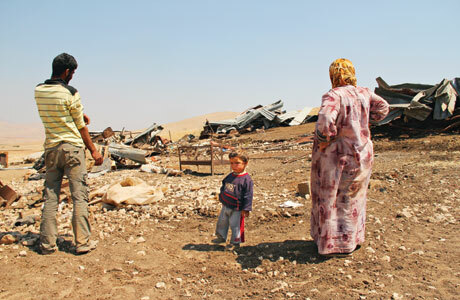 Daily life under occupation is hard, characterised by repression in the form of home demolitions (in many cases over and over again), destruction of personal property and farming equipment, harassment, violence and the stifling effects of military checkpoints. Denied the necessary permits to build, infrastructure and water pipes are regularly destroyed. In light of all this, one can understand the motto of the valley’s population: to exist is to resist. Helping people to do this is the Jordan Valley Solidarity campaign. 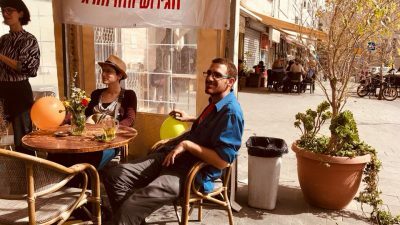 Rashid, a Palestinian in his late twenties who works with the group, describes its work as ‘popular and peaceful resistance – the struggle to stay on the land is the main resistance’. The campaign is the only grass-roots Palestinian movement in the valley. Based in the Friends Meeting House in the village of Al Jiftlik, it takes its lead from the valley’s communities, mobilising to support those facing repression and documenting abuses by the army and settlers. 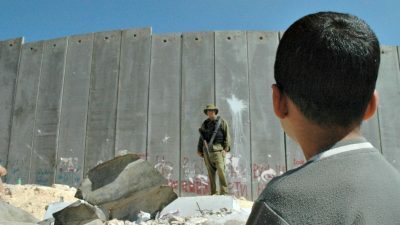 Ongoing building projects with mud bricks aim to create long-term Palestinian ‘facts on the ground’, including homes, schools and water pipes – even if building contravenes occupation policy. Hundreds of Palestinians from the Jordan Valley are involved in the JVS campaign in various capacities, such as building and teaching, and the loose network of solidarity extends throughout the area. Despite the relentless Israeli attempts to eradicate Palestinian life from the area, there have been successes. One is the village of Upper Fasayil, which has flourished since the building of a school six years ago. Homes have been built where before people lived in tents, and they have water and electricity. The work of the Palestinians is supported by people from around the world, who help with the campaign activities and spread the voice of the people in the valley through global links. ‘The most important thing is that people go there, see the situation and then come back home and talk about it because they’ve seen it with their own eyes,’ says Rashid. The campaign is seen as an evolving network. After initially twinning with a group in Brighton in 2006, there are now also groups in France, Spain, Italy and Japan. Unlike the top-down approach of many NGOs and aid organisations, the emphasis is on listening to what the Palestinian communities want and need, and working in the vein of friendship and solidarity between communities. Rashid asserts that this is the way of the future, the ‘right way’. While the occupation strengthens its grip on the land, the resolve of Palestinians to support each other, along with growing global civil society links, offer the best chance that the Jordan Valley will not be forgotten.